Came across a really good protein-yogurt recipe some time ago and have been enjoying it since then. 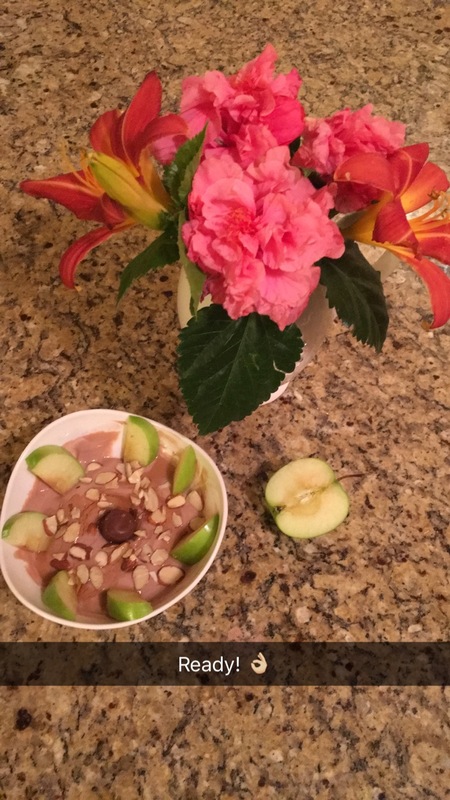 I like it because it’s a great dessert dip that’s easy and quick to make. It also fulfills my serving of protein, and has other healthy ingredients in there. This dip is a great variation for those who use protein powders for working out but also can enjoyed by just about anyone as dessert. The version I made in these images should serve two people because it may be too much sweet for one person alone. I used my usual whey chocolate protein powder but you can always make it less sweet by using a Vanilla or Cinnamon-French Toast flavored protein. You can even switch the almonds for chunks of chocolates or raisins. I am always looking for other ways to make my protein intake more flavorful, and interesting since it can become very repetitive. It’s also nice quick dessert to make for your guests. Enjoy by dipping apple in the dip! Next article9 Year Anniversary Already? Oh yes! I try lol ? ?